On Monday morning, David Cameron unveiled the latest Conservative Party election poster, warning against a Labour/Scottish National Party (SNP) coalition. The internet was quick to deliver a torrent of mockery. 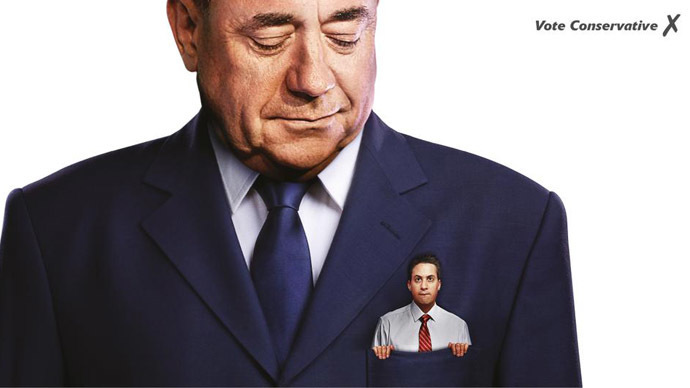 The poster features a mini-Ed Miliband – quickly dubbed Mini-band – sitting in the top pocket of former-SNP leader Alex Salmond. Am I the only one who thinks mini-pocket #Miliband is adorable and should definitely run the country from his shoebox office? The intention of the poster was to warn voters against the possibility of a Labour/SNP coalition, following analysis suggesting the SNP could nab many of Labour’s traditionally safe seats north of the border. Some Twitter users thought the photo of Miliband was far too flattering, and exchanged it for one of his more ‘iconic’ poses: the highly unflattering bacon sandwich shot. Rival political parties also took to Twitter to mock the poster, with UKIP presenting their own version, featuring Cameron in the pocket of US media mogul Rupert Murdoch. He told Channel 5 news he thought it was “fundamentally stupid to spend your time putting other parties on your posters,” adding “this is Lynton Crosby and the Aussie way of dictating policies and it shows their weakness,” in a dig at the Tory’s election strategist. Asked if he could rule out a deal with the Scottish nationalists, Balls said: “The SNP have said they don’t want a coalition. It’s not part of our plans. We don't want one, we don't need one, we're not after one. “No large party in the last 100 years – Labour or Conservative – has ever fought a general election on the basis they wanted a coalition or deal with a small party. It’s the last thing we want. What we want is a majority Labour government,” he added.